Brian got me “The River Cottage Cookbook” for my birthday a couple weeks ago. Filled with beautiful pictures of animals, crops and food, it’s intimidating. For instance the recipe for pork begins with a tutorial on how and when to select your piglet, what to feed it as it grows, and then when and how to slaughter it. They do have a chapter on hedgegrow, so perhaps I will be able to forage a little something, though in the city I think that’s called stealing. Not exactly a cookbook for a city dweller like me. But cookbooks can be aspirational too. And anyway, the pictures and writing are sublime. And, the bread pudding. I would describe it as really, really amazing. Brian said it was one of the best desserts he’d ever had. How’s that for glowing? Easy, light as air, tangy, creamy with earthy undertones, and buttery without being too rich. 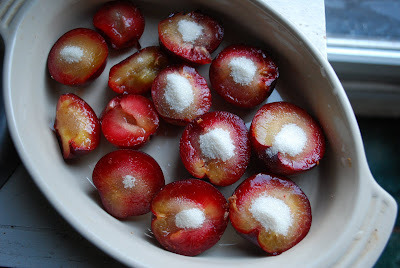 Not to mention the gorgeous, melt in your mouth, perfect-summer-flavor plums. A simple, straightforward recipe with total unfancy cred completes the package. I am typing all this out furiously so I can post in time to urge you to pick up the ingredients Friday or Saturday at your farmer’s market and enjoy a little bit of the good life. Butter a small baking dish and preheat the oven to 400 degrees. Rinse, halve and pit the plums. Lay skin side down in the baking dish and spoon 1/2 teaspoon of sugar into the centers. Bake just until the juices start to drip, 15 minutes. Set aside to cool for a few minutes, then carefully remove to a plate, being sure to also transfer any plum juice that has accumulated. At this point you can turn the oven off if you like. Cut the crusts of the bread and cut into 1″ slices, or strips–whatever height will make them almost flush with the top of the casserole. Generously butter the slices on both sides and set aside. Whisk the cream and milk together. In another bowl, vigorously whisk the cup of sugar into the eggs, and keep whisking until things are well-combined. Constantly whisking, drizzle the egg mixture into the cream and milk. Keep whisking for two or three minutes until you have a thin, airy custard. Let sit at room temperature while you deal with the bread. Arrange the bread in the baking dish by placing upright and at an angle; like dominoes but more upright. Tuck the cooled plum halves between each slice, toward the top. Slowly pour in some of the custard. Wait a while for the bread to absorb the liquid, then slowly add more. The longer this step takes–and especially if you have the time to wait for an hour–the more airy an delicate the pudding will be. At some point in the process turn the oven to 350 degrees. When you think the pudding has absorbed all of the cream mixture it will take–up to 1/4″ from the top. 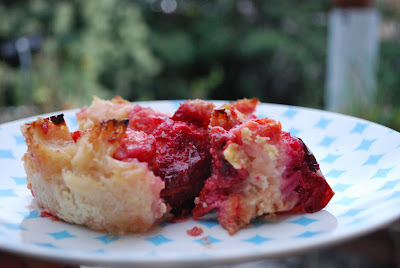 Drizzle with the reserved plum juices and put into the oven with a cookie sheet underneath. Bake for 35 minutes, until the sides are set with a jiggly center. Wait just a few minutes, then devour.